Disney have released three new posters for Pixar’s upcoming The Good Dinosaur. Imagine a world where the dinosaurs weren’t wiped out – that’s the premise of Pixar’s next big film (after Inside Out), The Good Dinosaur. It’s the biggest night of the showbiz year, the 87th Academy Awards. This is it, we’re in the final countdown to the 87th Academy Awards. I can’t wait to see Neil Patrick Harris take to the stage as host. Just before Christmas it was announced David Oyelowo and Lupita N’yongo look set to star together in new film Americanah. Now they’re in talks to work together again in new Disney movie Queen of Katwe which is about a young African chess prodigy, Oyelowo is expected to play the young girl’s mentor with Oscar-winner N’yongo appearing as her mother. Filming is expected to begin in the spring. Jennifer Hudson is to make her Broadway debut in a revival of The Color Purple. Hudson will play Shug Avery in the production which will open later this year and has Oprah Winfrey among its producers. Phylicia Rashad has joined the cast of new film, Creed. The film will see Sylvester Stallone return as Rocky Balboa as he becomes the coach of a young boxer played by Michael B Jordan. Rashad will play the young boxer’s mother. Filming is due to begin later this month. John Travolta is returning to TV for the first time in over 30 years. He will appear in new drama American Crime Story: The People vs O J Simpson. The show has been created by Ryan Murphy – the man behind Glee and American Horror Story – and will look at the Simpson trial from the perspective of both the defence and prosecution, Cuba Gooding Jr. will star as Simpson with former Friends actor David Schwimmer playing Robert Kardashian, one of Simpson’s lawyers. It looks like the new Ghostbusters movie is finally gearing up to start shooting this summer. The new film will focus on a group of female Ghostbusters with Melissa McCarthy in talks to play the lead character. Other actresses being mooted for roles in the film include Jennifer Lawrence, Emma Stone and Rebel Wilson. The film is expected to include cameos from Bill Murray, Dan Aykroyd and Ernie Hudson. Snoop Dogg will play himself in an upcoming episode of new drama series Empire. The show debuted in the States this week and tied with How To Get Away With Murder as the top premiere of the new TV season. Snoop will appear in episode 11 which is expected to air in late February or early March. 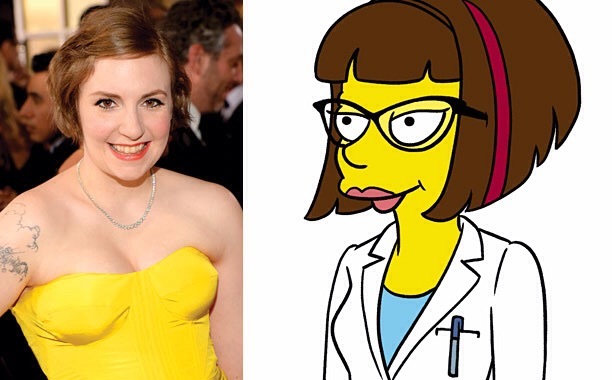 Lena Dunham will appear in The Simpsons later in the year. She’ll appear in the premiere episode of the show’s 27th season as Candace, a pharmacist who helps Homer when he develops narcolepsy. Sienna Miller will take over the role of Sally Bowles in the Broadway production of Cabaret next month. She follows Emma Stone who herself took over from Michelle Williams in the role. Miller who star in what’s currently expected to be the show’s final six weeks at Studio 54, running from February 17 to March 29. Reese Witherspoon, Matt Damon, Alec Baldwin, Neil Patrick Harris and Jason Sudeikis are to star in Alexander Payne’s new film. Downsizing is described as a social satire about a man who realises he could have a better life if he were to shrink himself. We’ll have a while to wait to see the film though, filming doesn’t begin until 2016 with the film expected to be released in late 2017. Ted Danson, Patrick Wilson and Jean Smart have joined the cast of the second season of Fargo. They join Kirsten Dunst and Jesse Plemons in the drama which is set in 1979 in Sioux Falls, South Dakota, and Luverne, Minnesota. Production begins on January 19. Michael Keaton’s Hollywood revival continues. He’s in talks to join Tom Hiddleston and JK Simmons in Kong: Skull Island. The film is set in the mysterious and dangerous home of the iconic ape as a team of explorers ventures deep inside the treacherous, primordial island. Michael C Hall is the latest actor to join the cast of Disney’s remake of Pete’s Dragon. Robert Redford, Bryce Dallas Howard and Wes Bentley have already been announced with newcomer Oakes Fegley playing Pete. No word yet on Hall’s role.